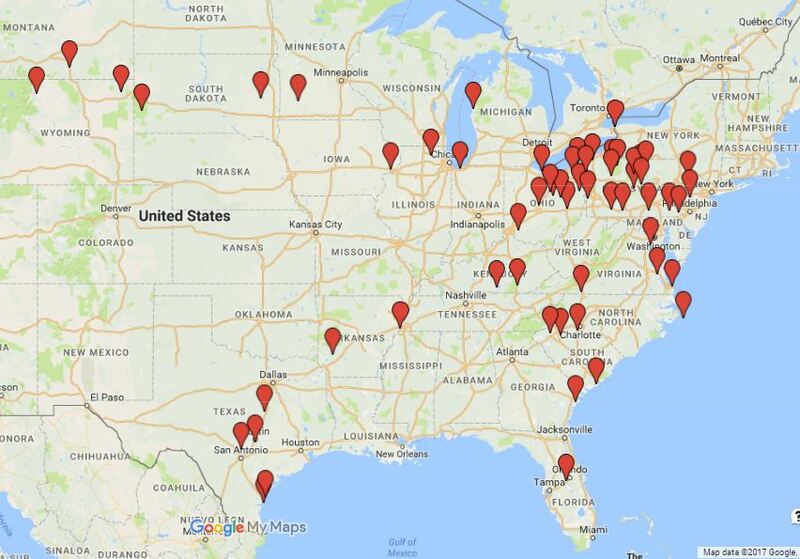 For history buffs or anyone who is curious about how the island came to be a winter home for American millionaires like the Vanderbilts, Rockefellers, Morgans, Hydes, Pulitzers and more, the tram tour is a must-do. 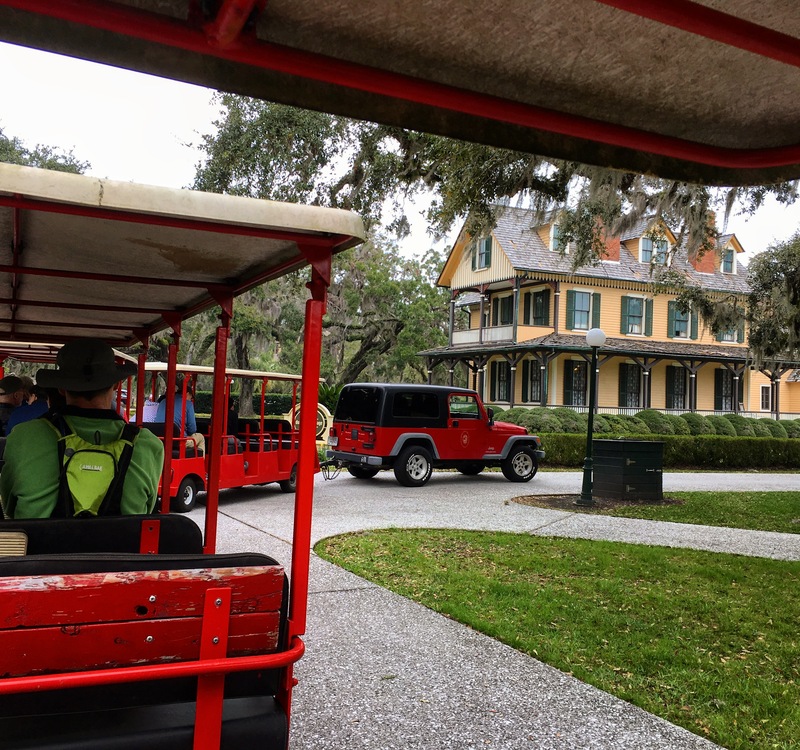 During the approximately 1.5 hour ride around the historic district, a guide details the history of the island, the homes, the Jekyll Island Club, and the people who put it on the map. In addition to stops in a few of the historic homes (including the first home ever built on the island, the Du Bignon Cottage; it’s the yellow house in the picture below), the tram ticket also grants access to Faith Chapel. 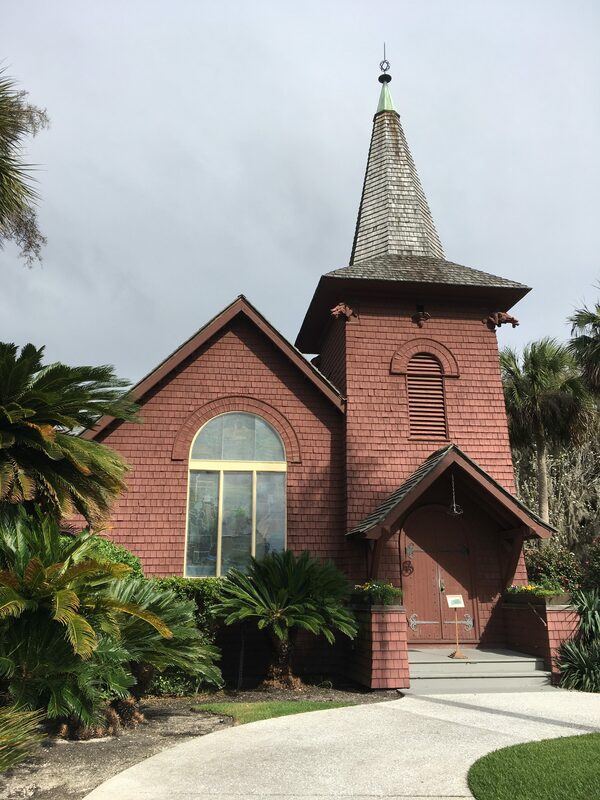 This small non-denominational chapel, which combines Gothic Revival architectural with a rustic design, boasts two stained glass windows–including one signed by Louis Comfort Tiffany. 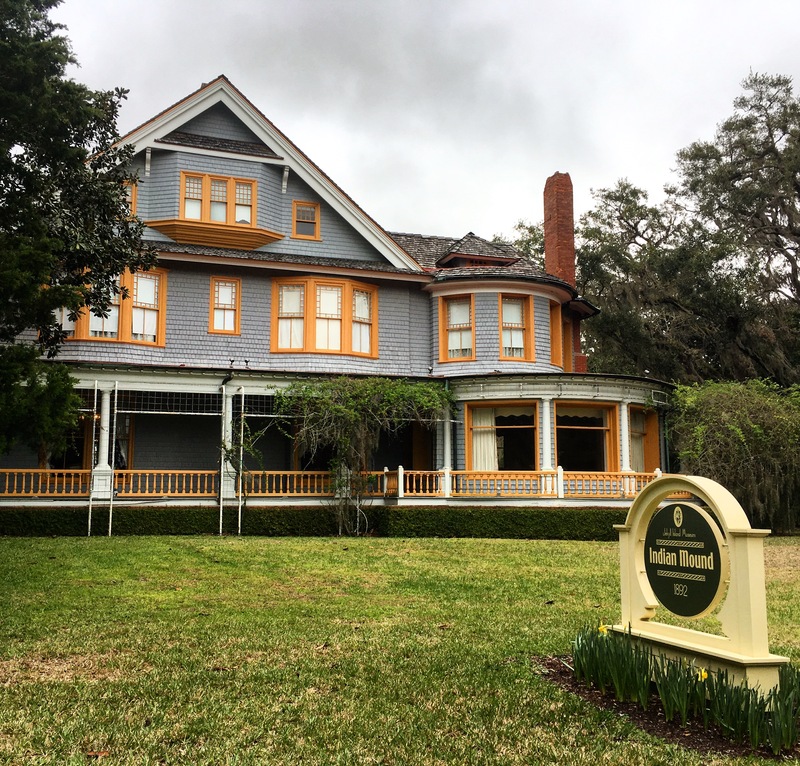 A few of the historic houses on the island are available for tours, including Indian Mound Cottage, which is so named for the mound of earth in the front yard that at one time was thought to be an ancient Indian burial site. 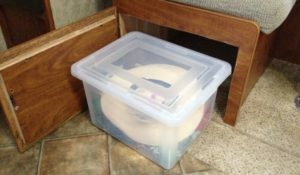 Later it was discovered that the mound was really just a shell midden, i.e., trash heap. 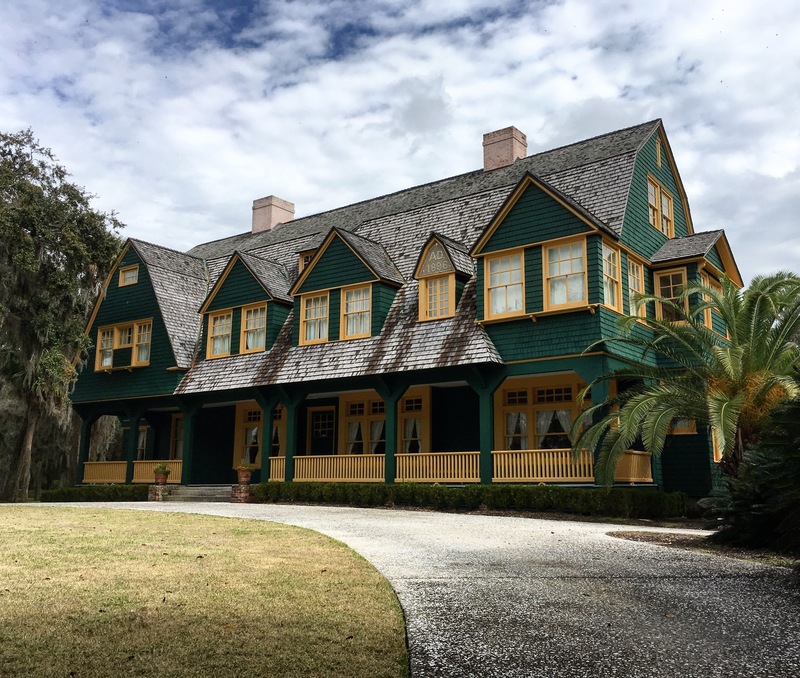 Standard Oil millionaire William Rockefeller, one of the founding members of the Jekyll Island Club, purchased the cottage in 1905. 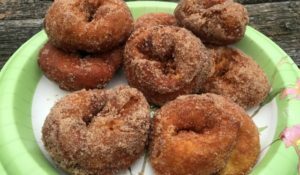 He and his wife Almira made it their winter home, and it quickly became the family’s favorite place to visit. Life on the island was supposed to be simpler than the opulence the families were accustomed to back home. The club even had strict guidelines by which homes could be constructed: If they were deemed too fancy, modifications to the architectural plans had to be made. “Simpler life” at Indian Mound, however, resembled a three-story, 25-room mansion with an elevator and walk-in safe. Although the existing furnishings are not original to the house, the preservation team has worked to create a setting that reflects what life would have been like at the home during those gilded years. 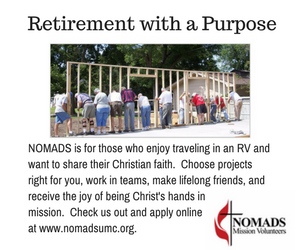 Interior photos are not permitted, but the outside of the home reflects the beauty within. 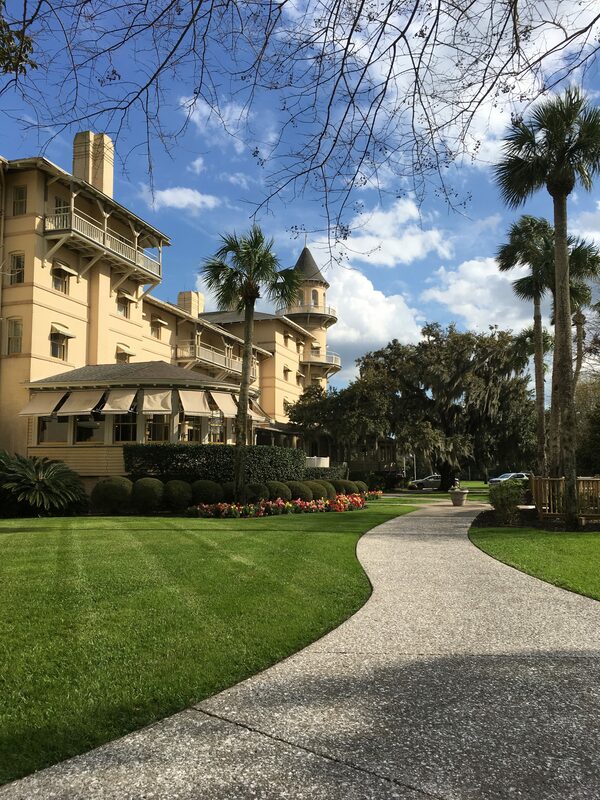 At the Jekyll Island Club, guests can step back in time with a visit to the Grand Dining Room where you can enjoy upscale dining just like Jekyll Island’s first guests did a hundred years ago. For something extra special, consider attending one of the Victorian Teas hosted on Friday and Saturday afternoons. 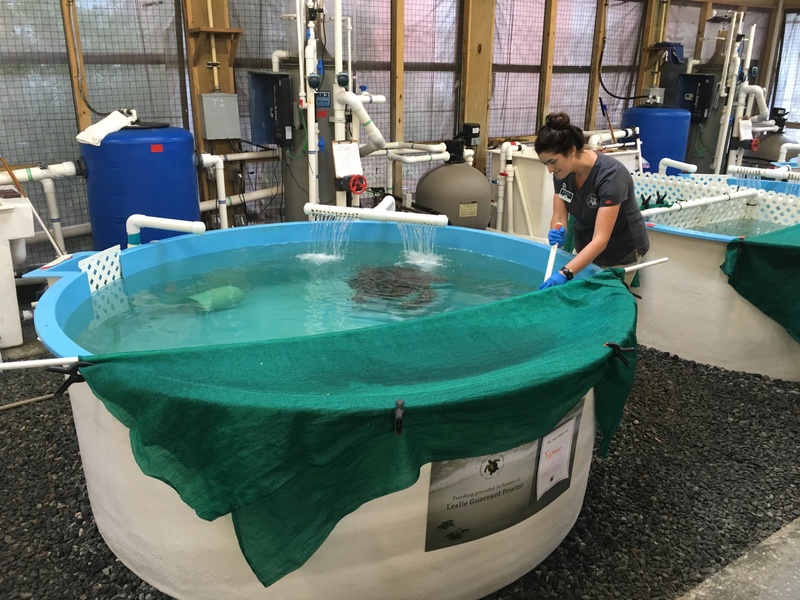 The Georgia Sea Turtle Center is first and foremost a hospital for sick and injured sea turtles–the only place of its kind in the state of Georgia. 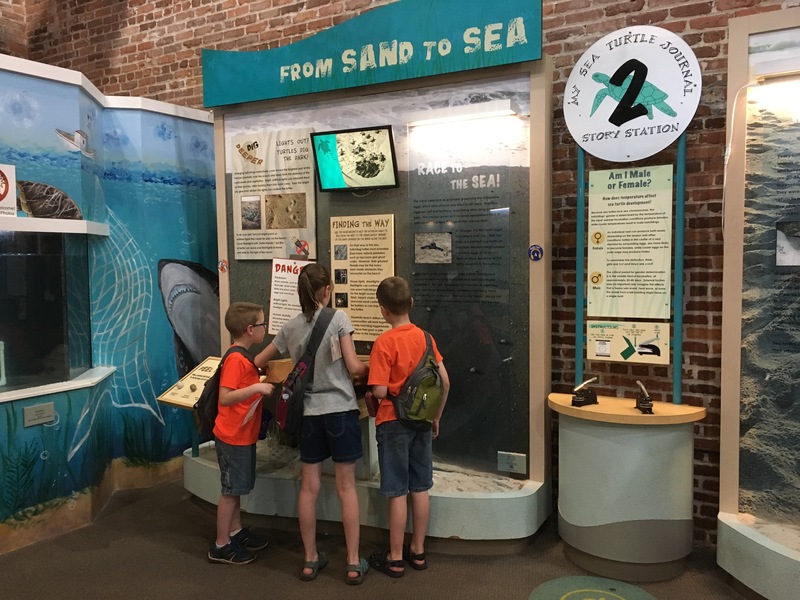 But it also features a visitor’s center where engaging, hands-on exhibits teach about the life-cycle of turtles, turtle rehabilitation, and turtle conservation. Families begin their visit with a card that they stamp at four different stations as they track the life of their sea turtle. 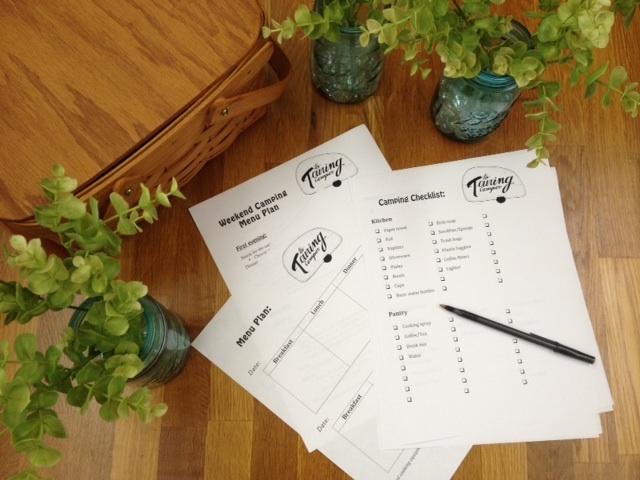 Each station offers more than one “stamp” choice so every turtle card will have a slightly different story if families choose different options. 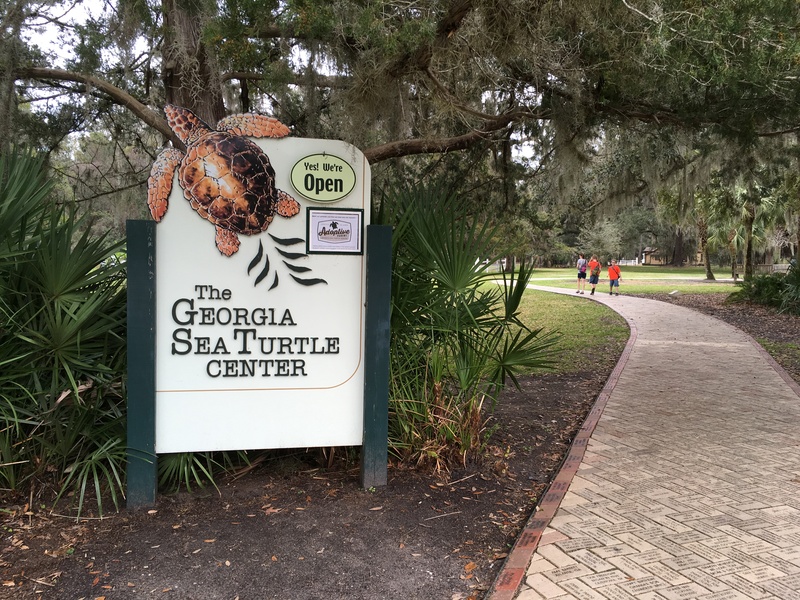 Visitors can also attend special programs where you can “meet the patients” or watch a turtle feeding. Our kiddos thoroughly enjoyed learning about the current patients’ conditions, their treatment, and their future prognosis. They also had fun watching through a glass window in the main visitor’s center as veterinary staff treated one of the turtles. For $6 per child (ages 4-12) and $8 for adults, it’s a great family-friendly stop (especially for rainy island days!). 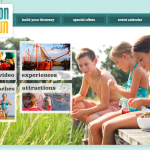 If your visit to Jekyll Island is in January or February, then your family is in for a special treat! 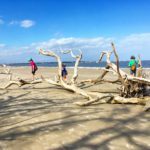 Jekyll Island offers a unique scavenger hunt for visitors to the island. 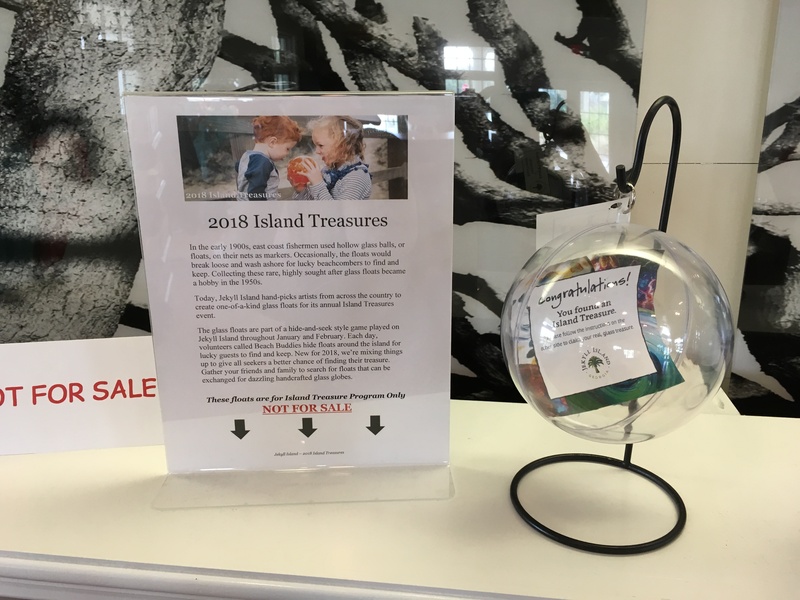 Every day during the special hunt, Beach Buddy volunteers hide several plastic float balls around the island. 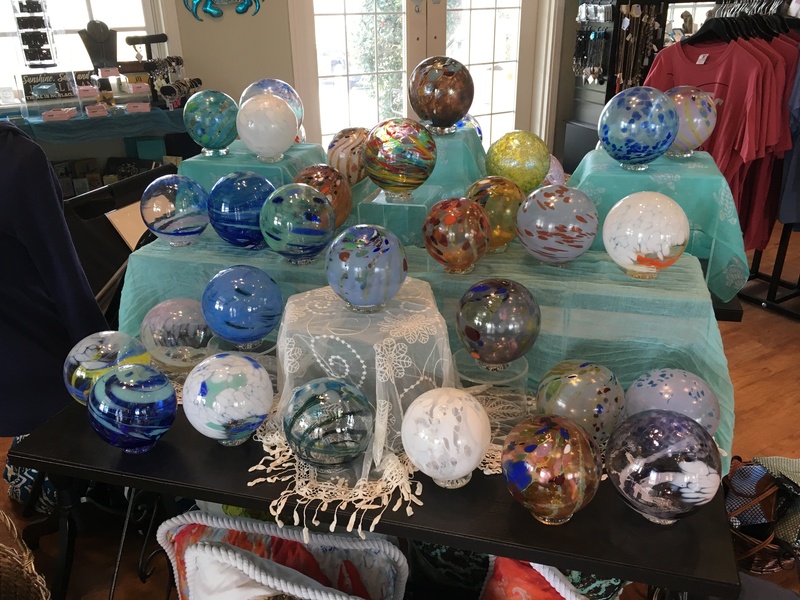 People who find them can take them to the island’s visitor’s center where they get to exchange the plastic ball for a glass float ball, specially created by artisans to replicate the ones fishermen used to mark their nets in the early 1900s. 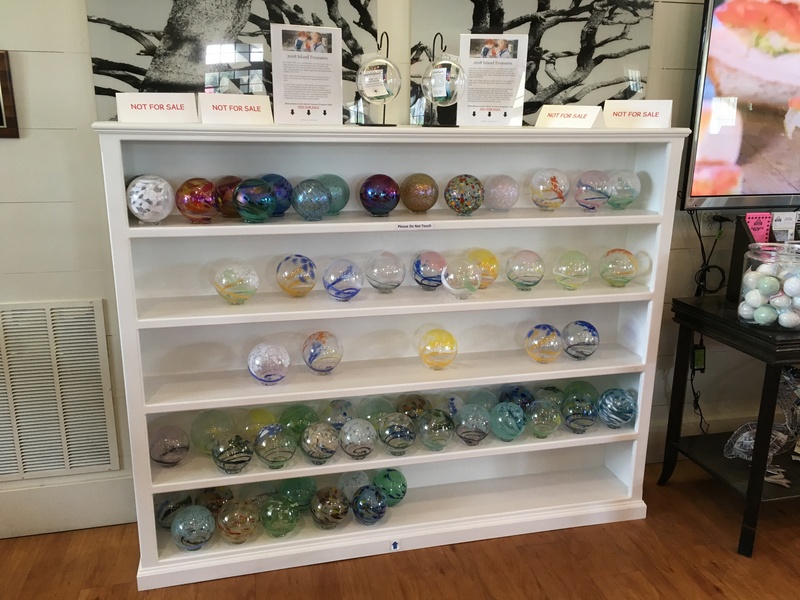 This year Beach Buddies hid 450 of the clear, plastic globes in “plain site” around public areas on the island. Although we didn’t find any of the island treasures (this year at least! 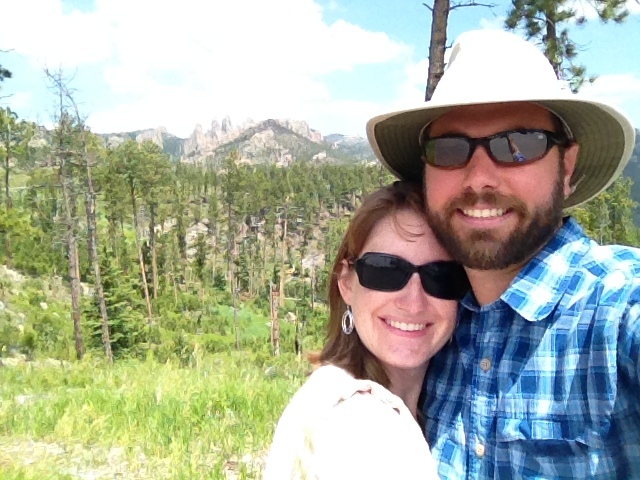 ), we found the treasure hunt was a great way to explore lesser known nooks and crannies of the island. 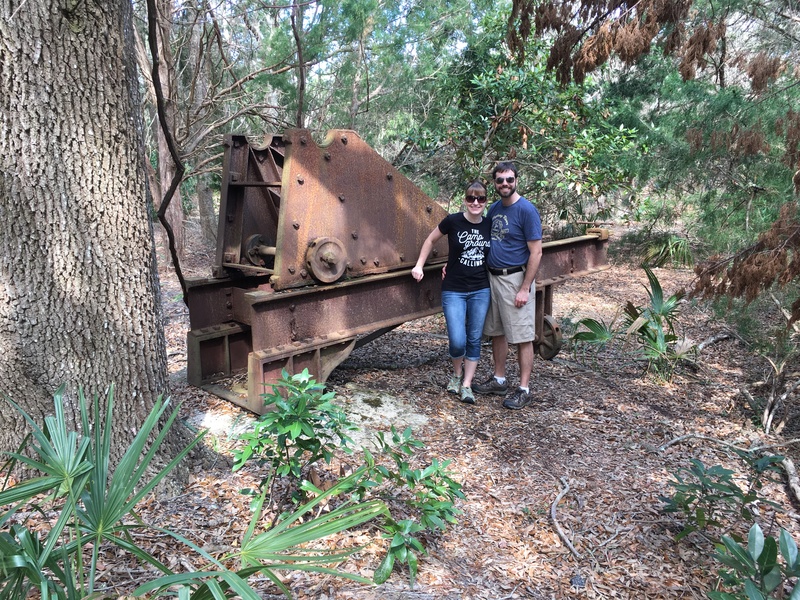 While you are out looking for those island treasures, you might be near a few “hidden treasures” we learned about, including a hollow tree you can stand inside and cannon mounts that date back to the Spanish American War. 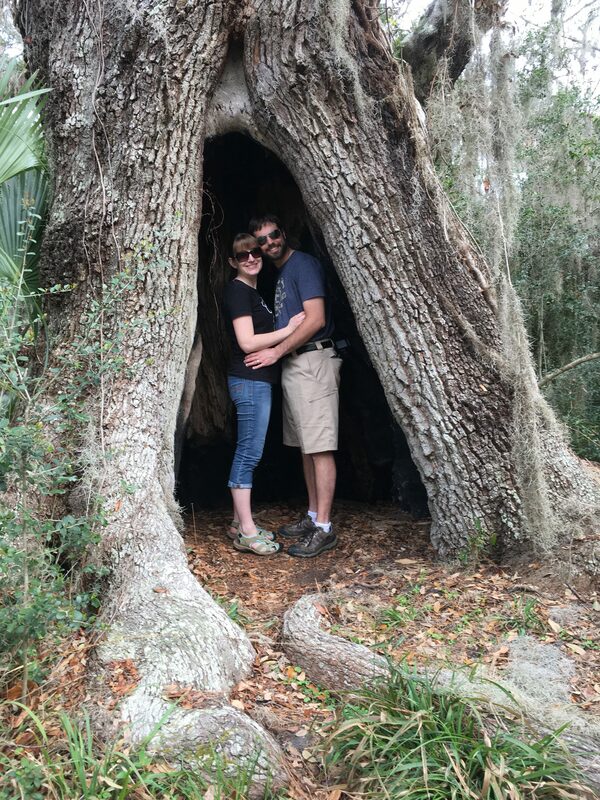 The hollow tree is located just off a bike path trail. 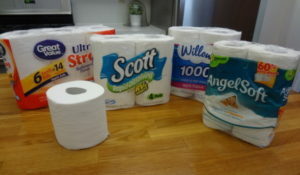 To find it, take Riverview Drive to Bond Street. Park in the grass across from Bond Street, and follow the walking path onto the bike path. Turn right onto the bike path and walk just a little bit until you see an area on the right where a trail has been beaten down. Walk a little bit along this beaten down path and the hollow tree will be just ahead on the left. To find the historic cannon mounts, follow Riverview Drive South or Beachview Drive South to Macy Lane. Take Macy Lane to the end of the street and you will see a small parking area at the intersection of Macy Lane and St. Andrews Drive. Follow the trail past the “no pets allowed” sign. When you pass the “fire control road” sign, turn right up a slight hill. This trail will snake around a little bit until you arrive at the cannon mounts. 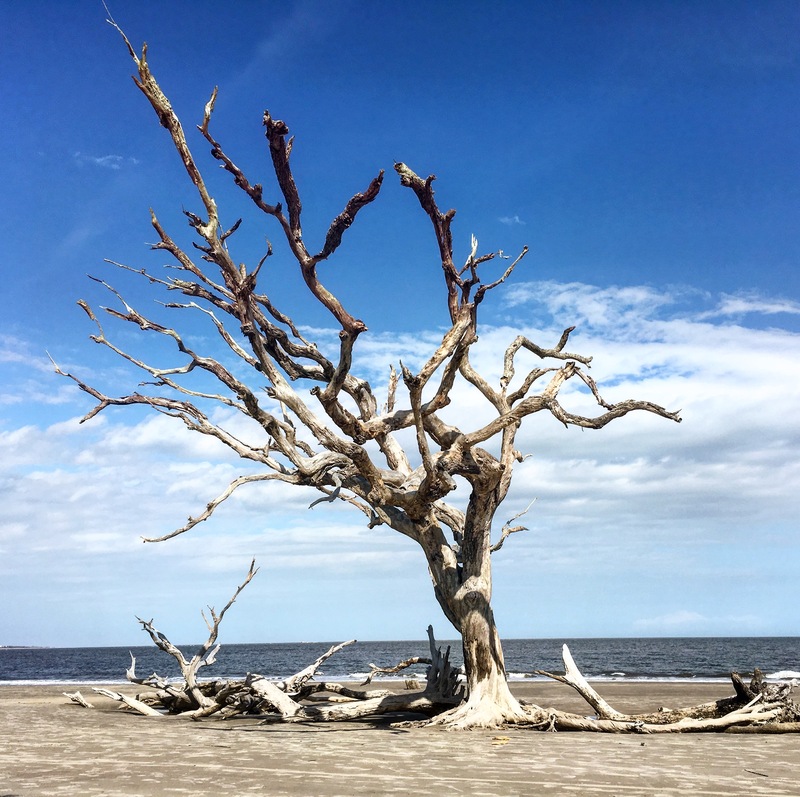 This picturesque location is where many a family has posed for photos among the remains of ancient live oak trees and other driftwood. Families of all ages and stages can be found walking the beach, but it’s also a huge natural, jungle gym where kids can play and climb. Our kiddos loved scaling across the trunks and up the limbs of the toppled trees. Bring a hammock and find a spot to enjoy the ocean view. Unfurl a kite and toss it up on a windy day. Or bring along the sand toys and let the kids build sandcastles on the beach. 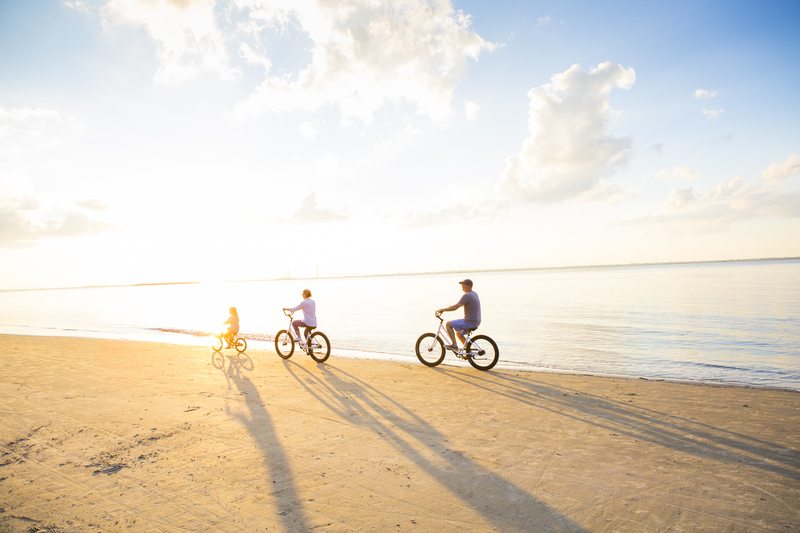 With more than 20 miles of bike trails that circle the island, Jekyll Island is a great place to bring the bikes. 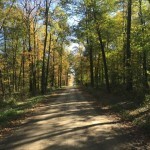 The bike trails pass by the beach, around the historic district, and through wooded areas. Along the way there are several spots where families can stop to use the restroom. 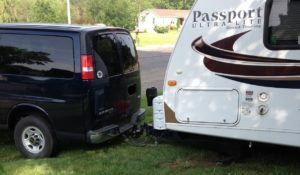 If you can’t bring your bikes with you, the island offers lots of rental options, from adult and kid bikes, to tandem bikes, bike surreys, and bike trailers. 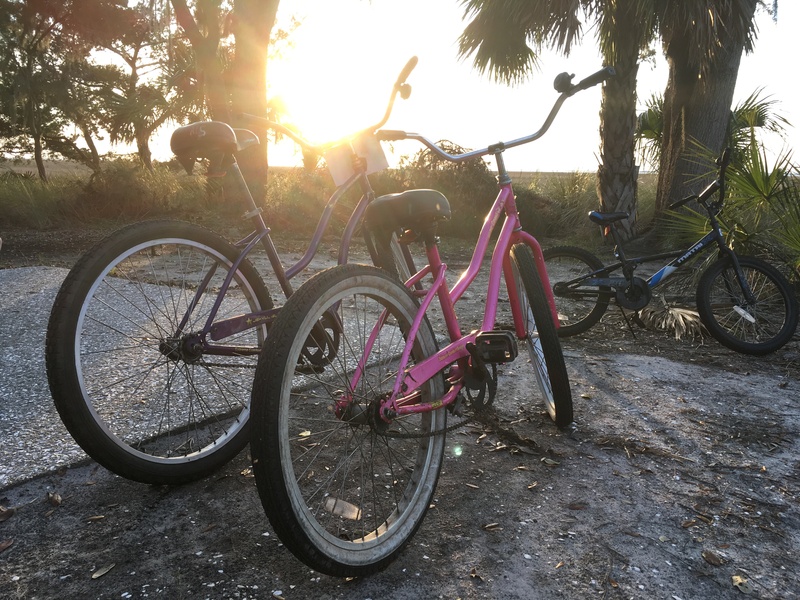 Bike rental locations are scattered around the island, including the Bike Barn that is located next to the miniature golf course. 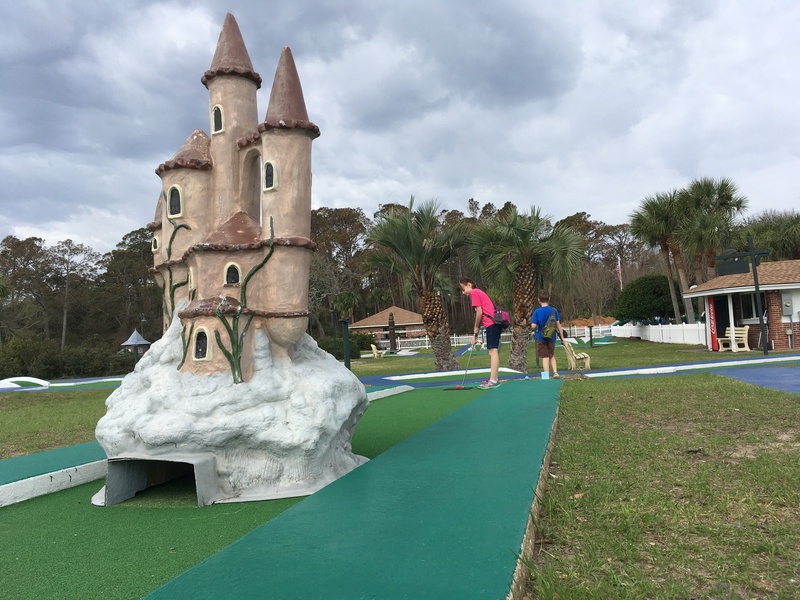 The miniature golf site offers two 18-hole courses, one for beginners and another for more advanced players. Kids will love the animal characters and various themed-obstacles that comprise both courses. 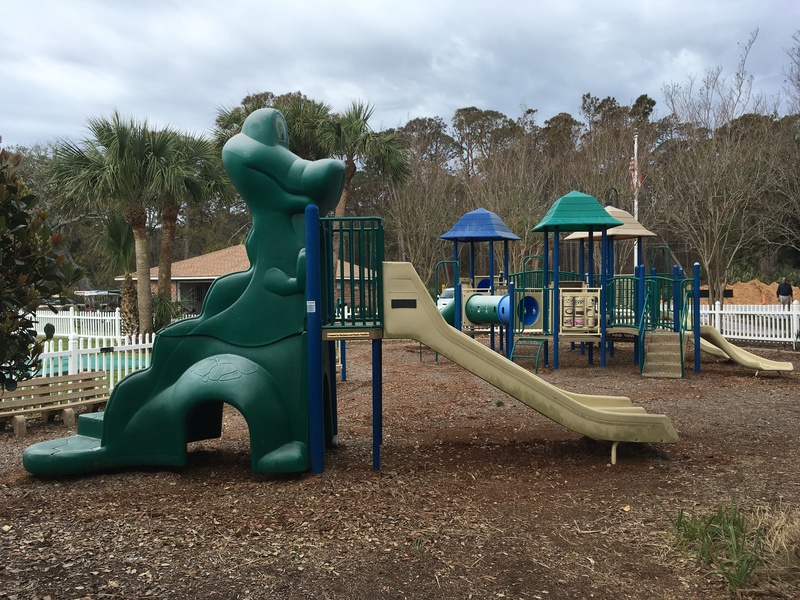 After a round of miniature golf, if your kids are like ours, they will likely want to run off some more steam at the playground, which is located in the same complex. 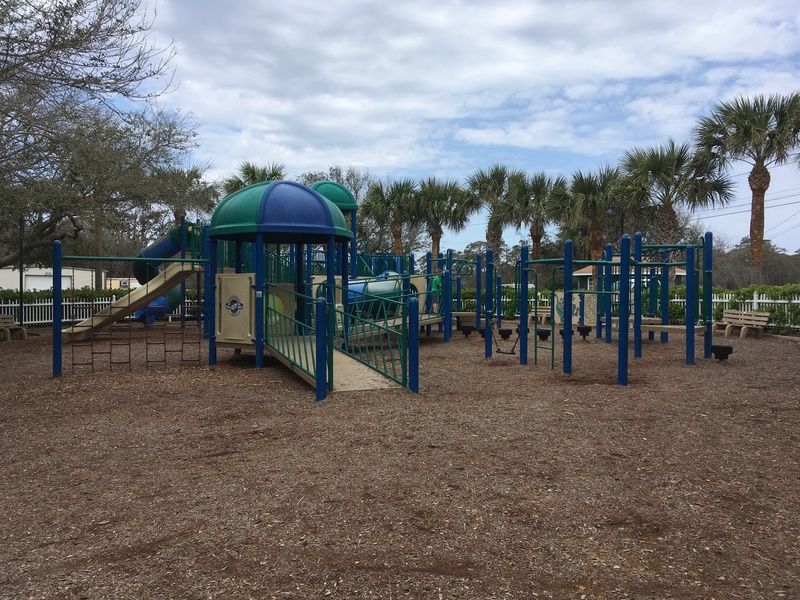 Two playgrounds offer age-appropriate play equipment for older children on one and preschoolers on the other. 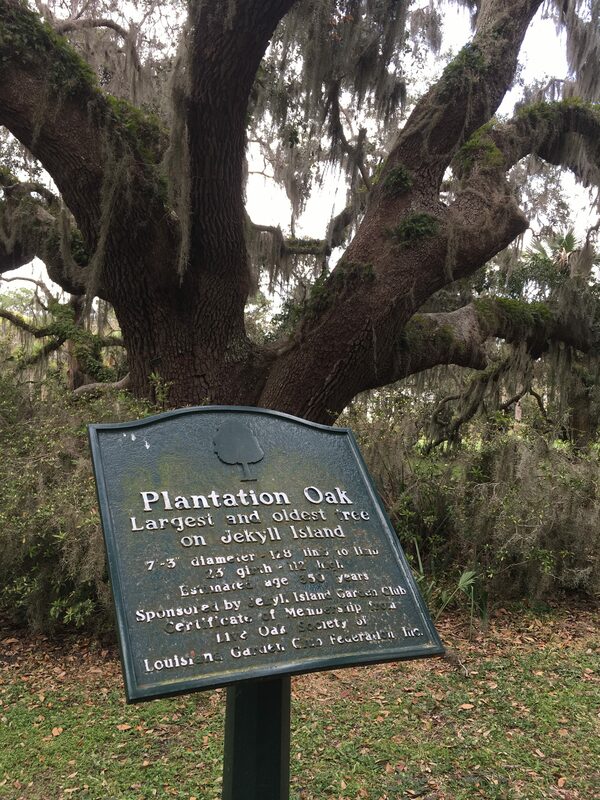 Over in the historic district of the island stands Plantation Oak, the largest live oak on the island. It is estimated to be approximately 375 years old. Nearby is the Avenue of Palms, which features nearly 300 palm trees lining Plantation Road. 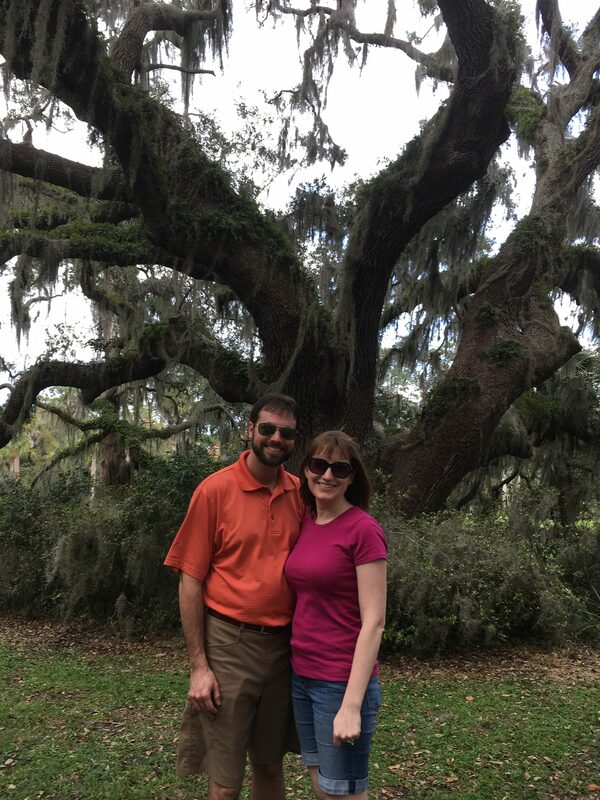 Some of those trees date to the late 1800s. Also be sure to stroll by the glass-encased telephone that commemorates the first transcontinental phone call, which took place on the island in 1915. 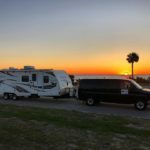 It’s located not far from the Jekyll Island Club, catty-corner to Indian Mound. 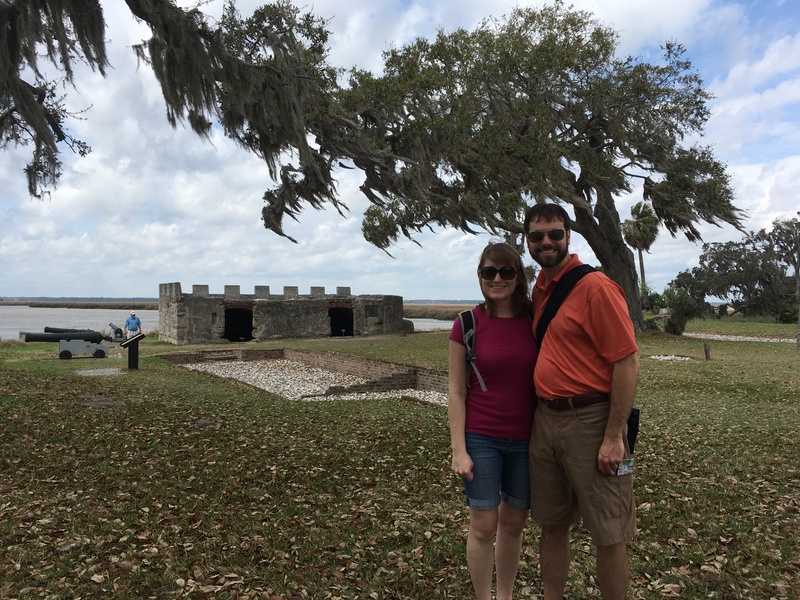 Although the Fort Frederica National Monument is not located on Jekyll Island, it is a great spot for families to explore while in town. 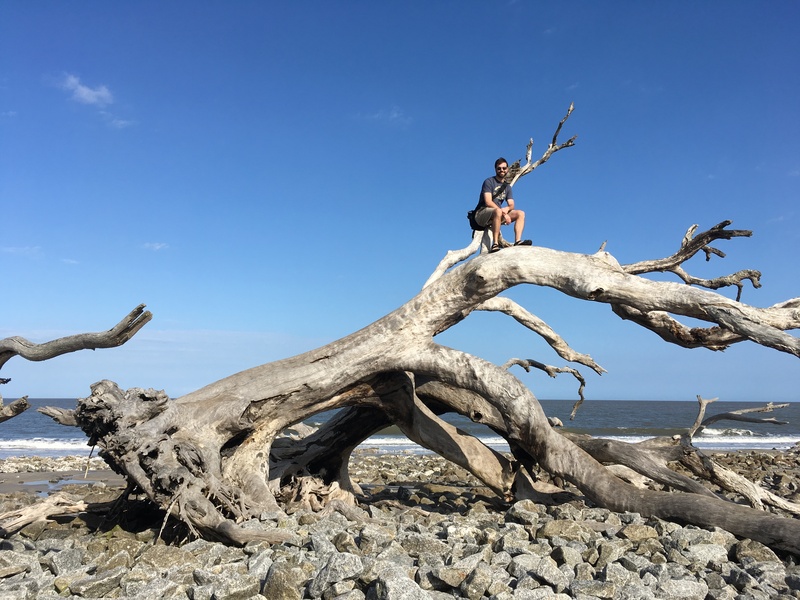 This national park site on nearby St. Simons Island offers a Junior Ranger badge program that is one of the best our kids have had the chance to do. Rangers provide the kids with a haversack filled with fun tools (like spyglasses, a compass, and map) to help them complete their mission. 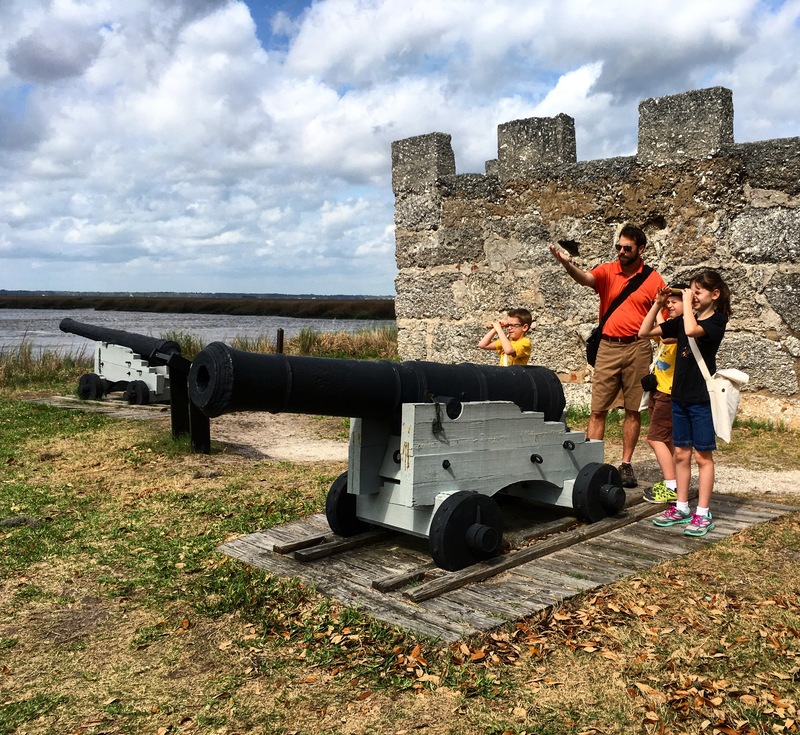 The interactive, pop-up booklet guides the children around the ruins of Fort Frederica. 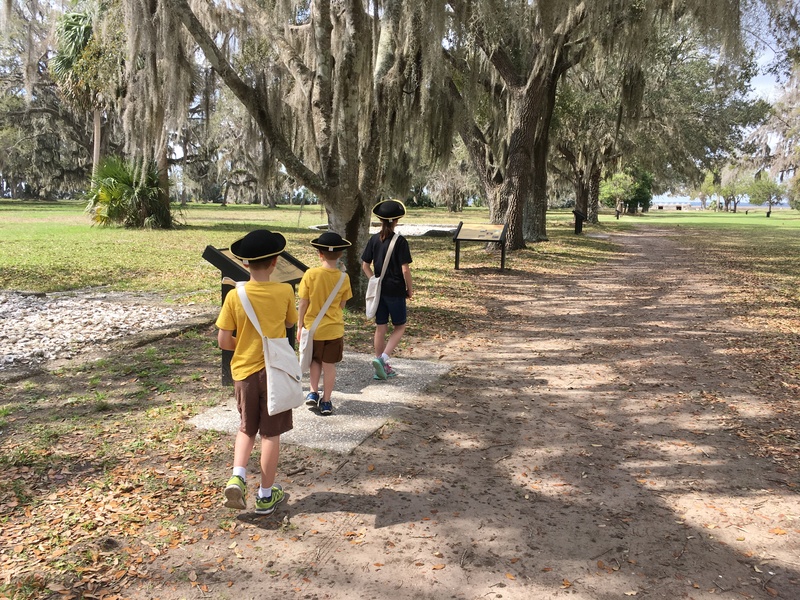 If you have time before visiting Fort Frederica, children can also complete the Junior Archaeologist and Underwater Explorer Badge packets. 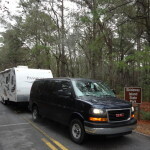 If they do, they can earn a special Fort Frederica Master Junior Ranger patch in addition to the badge. 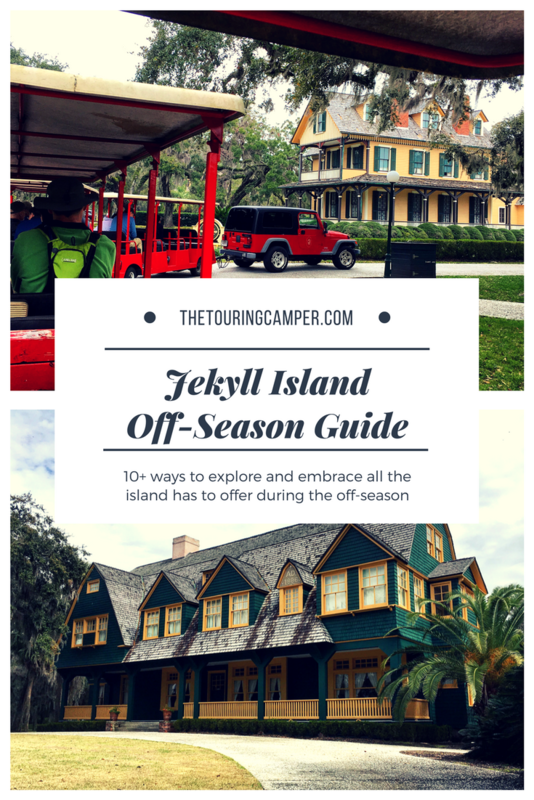 Do you have any other ways to enjoy Jekyll Island in the off-season? 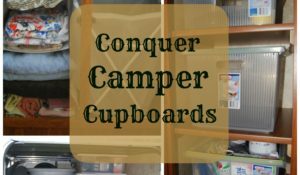 If so, leave us a comment below. 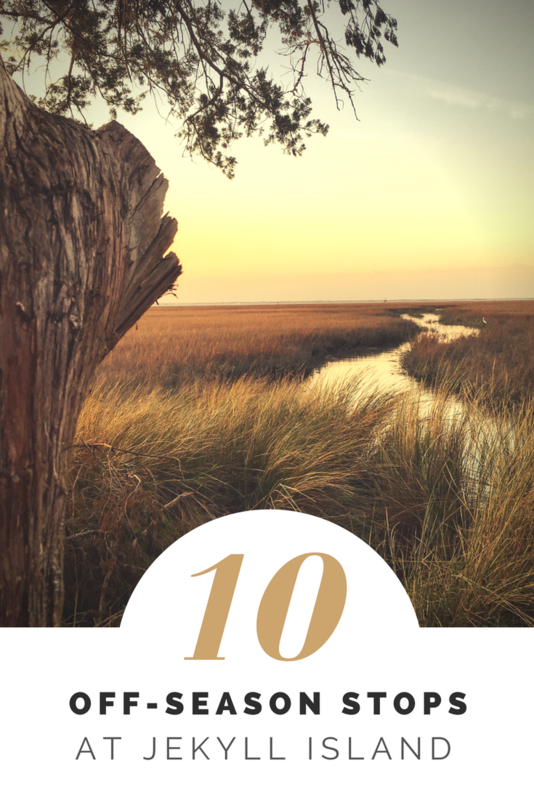 Skidaway Island State Park, Savannah, Ga.
A family fun guide to Charleston, S.C.